1. The bride and groom have put their trust in us to plan a successful destination wedding for them. The best way for us to manage their wedding plans is to book and manage every reservation so we can coordinate each detail of the wedding event. 2. Often times the bride and groom have already set aside a room block and signed a contract for those rooms. Or, they may be earning amenities for their wedding event. Rooms booked outside of their block do not count forwards fulfilling their contract or towards wedding amenities. They are counting on your reservation. 3. We give you personal and individual attention. You will be a real person, and not merely a confirmation number. We are able to customize your trip any way you like, and can even help if you'd like to extend your stay, change resorts after the wedding, or bring your family. 4. We monitor your reservation and keep you informed of any changes that could occur. Even after you finalize your booking, we will continue to work with you to make certain everything goes smoothly. 5. 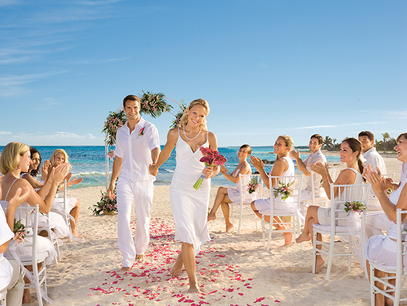 You will be part of the wedding group and the resort will recognize you as a destination wedding guest. You will appear on our final guest list that gets sent to the resort prior to arrival. 6. We work on getting you the best price. If you see a less expensive price for the exact package - dates, airline, flight times, taxes, insurance, transfers, etc. - give us the opportunity to see if we can get the same price. This way we can book your reservation and you can become part of the wedding party. Usually online prices are lacking something like transfers or taxes. Please give us the opportunity to help you with this. 7. If you have miles or prefer to purchase your airline ticket online, that’s fine. We can make your reservation just for the hotel package. Even if you book only the hotel through us, we will still make the arrangements for your airport transportation. And, you will still be included on the final rooming list.